All software systems will eventually go web-based and online. For years, system developers are trying to find replacement for the very commonly used but unreliable “username” and “password” system login with better authentication method. The mass system security market remains untapped. Introducing the FingerTec Online Fingerprint Identification System (OFIS), the long awaited system to solve the loosen remote and online verification problem with its added biometric features. 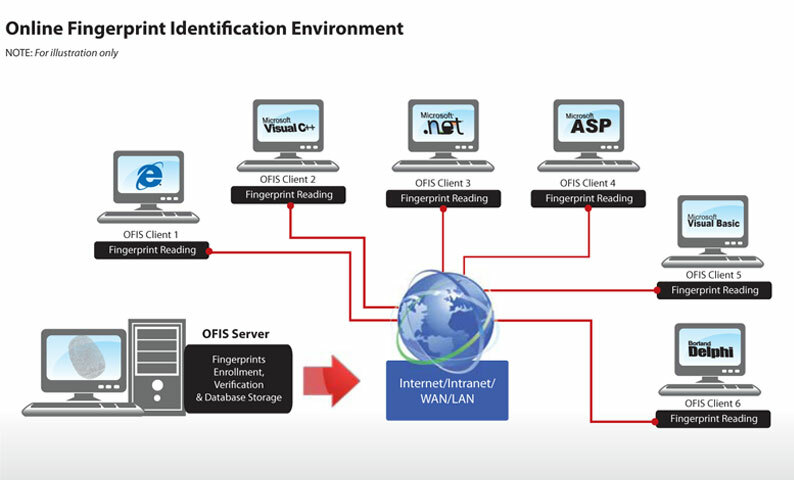 The FingerTec OFIS runs on Browser/Server (B/S) Environment, where user can enroll their fingerprint through FingerTec OFIS Scanner that links to a PC. For verification, the user’s fingerprint is to be read by the scanner and the encrypted fingerprint data will be transmitted to be compared and verified with the stored fingerprint templates at the remote back-end server through the Internet/Intranet/WAN/LAN. FingerTec OFIS SDK (Software Development Kit) consists of FingerTec OFIS Server and FingerTec OFIS Client modules. Deploy a uniquely fast and accurate fingerprint verification technique, OFIS can be integrated seamlessly and easily into any solutions and systems to enhance its threshold security. Your first class solution shouldn’t be dampened by the mediocre threshold entry. Tolerate no more; your choice is FingerTec OFIS!